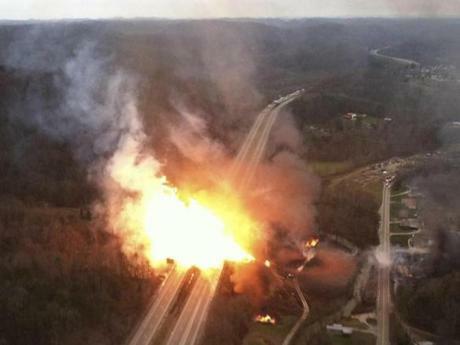 In 2012, a NiSource subsidiary, Columbia Gas Transmission Corp., was blamed by federal investigators in a pipeline rupture in Sissonville, W. Va. The utility at the center of Thursday’s catastrophe in the Merrimack Valley was in the midst of a massive effort to replace hundreds of miles of aging gas pipes in Massachusetts and head off persistent and potentially dangerous gas leaks. While the catalyst for the explosion remains under investigation, records show that the company, Columbia Gas of Massachusetts, has been fined tens of thousands of dollars by the state’s utilities regulator in recent years, and its corporate parent linked to serious blasts in at least two other states. Since 2010, the Massachusetts Department of Public Utilities has fined Columbia Gas for safety violations that included faulty pressure testing and response procedures, insufficiently covering new service lines, improperly classifying leaks, and breaking rules around the use of leak repair kits. 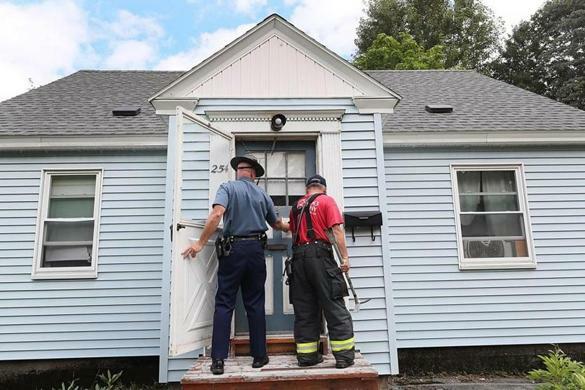 The state agency found Columbia Gas was slow to respond to a 2012 Seekonk fire fueled by a broken gas pipe, and ordered the company to update its emergency response plans and develop new training programs. Sara Rollet Gosman, a University of Arkansas professor who specializes in environmental and energy law, noted Columbia Gas has been responsible for six of the 19 significant gas distribution incidents in Massachusetts since 2010. Prior to Thursday, the most serious was a destructive explosion in Springfield in 2012 that injured 18 people. In that incident, a company worker investigating a gas odor at a downtown nightclub accidentally punctured a high-pressure gas line, triggering an explosion that leveled the building and damaged dozens of others, authorities said. “It felt like a bomb fell in front of the building,” a neighbor told the Globe at the time. The Massachusetts state fire marshal determined the Columbia Gas worker relied on incorrect sidewalk markings for the gas line’s location. The company reached an $850,000 settlement with the city and paid millions of dollars to settle other claims and lawsuits. Springfield attorney Daniel D. Kelly, who has filed about two dozen cases against Columbia Gas, said workers at the nightclub had been smelling gas for months and still question the cause. He called for greater scrutiny of the company. The company expressed condolences for Thursday’s explosion. In all, some 80 fires and explosions were reported, killing one resident and sending 13 people to the hospital. On Friday, Governor Charlie Baker declared a state of emergency and directed another energy company, Eversource Energy, to lead the recovery. In the natural gas world, pipeline explosions are rare but carry major consequences, said Gosman, the University of Arkansas professor. While companies are required to abide by safety and risk management rules, and routinely analyze potential threats, she said, operators are given a lot of discretion in carrying out their work. Columbia Gas is owned by NiSource Inc., a large utility based in Indiana that provides gas and electric service to nearly 4 million people in seven states. On Friday, NiSource’s stock took a major hit, declining 12 percent, as investors weighed the potential costs of the catastrophe. Across the country, utilities have been pushed by state and federal regulators to aggressively replace older, leak-prone equipment after a California pipeline explosion killed eight people in 2010. In 2014, Massachusetts required local gas utilities to document and plug thousands of potentially dangerous gas leaks following studies that showed the problem was far more pervasive than previously thought. Columbia Gas is one of a number of natural gas companies doing business in Massachusetts. Others include National Grid, Eversource Energy, and Unitil. Like other companies, Columbia Gas had been working to address the new federal and state requirements. 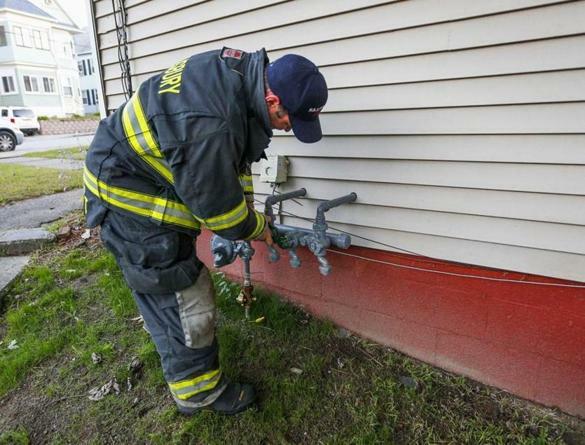 On Thursday — the same day as the explosions — Columbia Gas announced it had scheduled nearly a dozen upgrades to gas lines in the three Merrimack Valley towns. “They seem to be ahead of the other utilities in terms of dealing with gas leaks and infrastructure,” Schulman said. Mark McDonald, president of NatGas Consulting, a Boston-based company that investigates gas explosions, said the sheer volume of work facing gas utilities across the country has sparked concerns that companies are tapping unqualified workers. On Friday, state and local officials criticized Columbia Gas and demanded answers on the cause of the explosion and the company’s response. A group of federal lawmakers — Representatives Seth Moulton and Niki Tsongas, and Senators Elizabeth Warren and Edward Markey — sent a sharply worded letter to Bryant, the company president. Among the questions was whether Columbia’s workers were adequately trained. Columbia Gas and its affiliates have also been blamed in recent years for other gas leaks and explosions. In Ohio, state investigators ruled in 2015 that Columbia Gas of Ohio was at fault in a serious explosion that left eight homes “uninhabitable” and damaged more than 20 others. The Public Utilities Commission of Ohio faulted an “improperly abandoned natural gas line” by Columbia Gas in the community of Upper Arlington. In 2014, the National Transportation Safety Board accused a NiSource-owned gas transmission company of failing to detect corrosion in a pipeline that ruptured in West Virginia, and then of being too slow to act as the crisis unfolded. The pipeline explosion destroyed three homes, melted the siding of nearby houses, and heavily damaged an interstate highway, according to the NTSB. The rupture was so powerful it launched a 20-foot segment of the high-pressure pipe more than 40 feet from where it had been buried. No deaths or serious injuries were reported, officials said. “Remarkably, no lives were lost in this accident, but the potential for tragedy was clearly there,” NTSB Chairman Deborah A.P. Hersman said in 2014. NiSource has since sold the company in the 2012 West Virginia explosion, Columbia Gas Transmission Corp., which is now part of Calgary-based energy corporation TransCanada. An earlier version of this story had an incorrect name for Mark McDonald’s business. He is president of NatGas Consulting, a Boston-based company that investigates gas explosions. The Globe regrets the error. Follow him on Twitter @mrochele.